SOFT galleri har gleden av å innlede høstsesongen med Hilde Frantzens separatutstilling Terrenget – der landet ligger. Hilde Frantzen (f. 1982) bor og arbeider i Oslo. Hun har bachelor i avdeling for tekstil (2005 – 2008) og mastergrad fra Kunsthøgskolen i Bergen (2008 – 2010). I 2008 var hun European Textile trainee ved University of Art and Design, Helsinki, Tilburg Textielmseum og Ratti textile company i Italia. Blant de siste separatutstillingene hennes er “Feltarbeid” på Galleri Svalbard i Longyearbyen (2017) Kunst på vandring arrangert av Akershus Kunstsenter (2015) og på Galleri BOA i Oslo (2015). Hun har også deltatt på en rekke gruppeutstillinger i Norge og utlandet, deriblant Tyskland, USA, Sverige og Litauen. The title of this exhibition (Terrain – Where the Land Lies) relates to Hilde Frantzen’s ongoing project of trying to capture nature’s essence with a research method she herself has developed. In recent years she has done field work in the Norwegian mountains and on the islands of Svalbard and Lofoten. In Ny-Ålesund she lived on the outskirts of civilization along with researchers from all over the world. Inspired by their tools and methods, she did research on the landscape and on ice and snow from an artistic perspective. 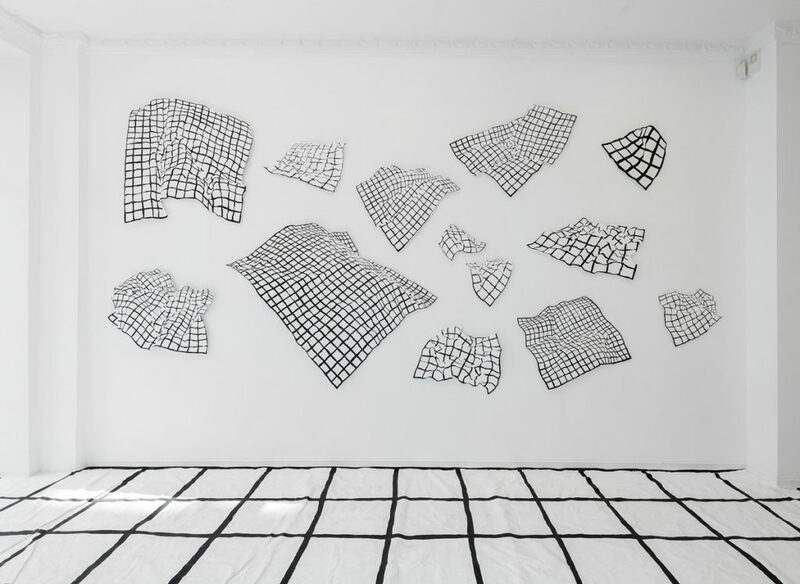 Frantzen paints a grid on a cloth, then lays it out in nature. Each and every stone, crack and movement in the terrain affects the grid. The geometrical pattern stands in contrast to the environment and can be experienced as a virtual world that has landed on the natural landscape. 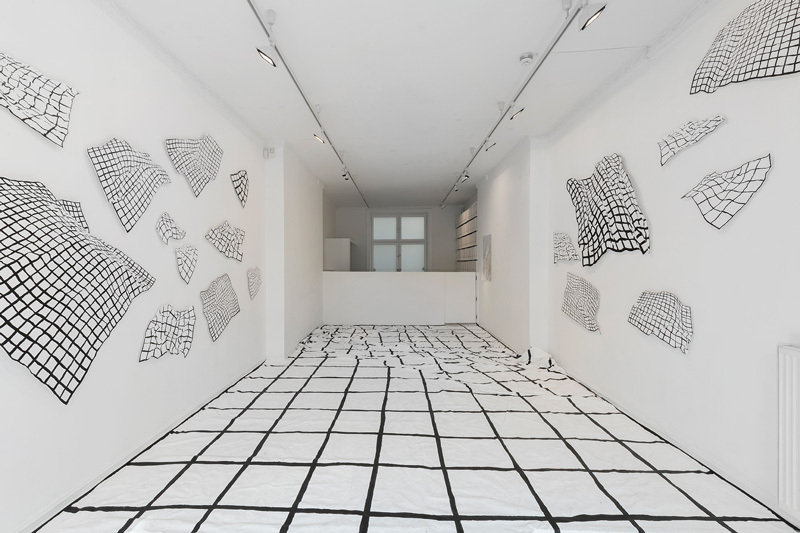 The results of surveying a landscape are transformed into textile reliefs and drawings. My findings can perhaps not give answers, but I try to find the beautiful and unfathomable aspects drawn from researchers’ methods, interpreting them from my own perspective. I use the tools of science to organize reality and put it in a context that a wider public can read. For Frantzen, the results stand as physical paintings activated by nature, where the abstract and intangible surface painting becomes real and gains physical form. In this way she problematizes and challenges painting’s physical aspects, limits and flatness. She wants to conjure a physical feeling, a mental-material reaction, by using textiles to examine the landscape and its being in new ways. In everyday language, we often use nature as a means of orientation, a measuring instrument. For example: light as a feather, heavy as a stone, tall as a mountain, etc. I think it’s interesting to study this at a time when megabytes and gigabytes are the most common units of measurement. Personally, I find it challenging to relate to physics. How much does a megabyte weigh? How thin is a tiff file? Hilde Frantzen (b. 1982) lives and works in Oslo. 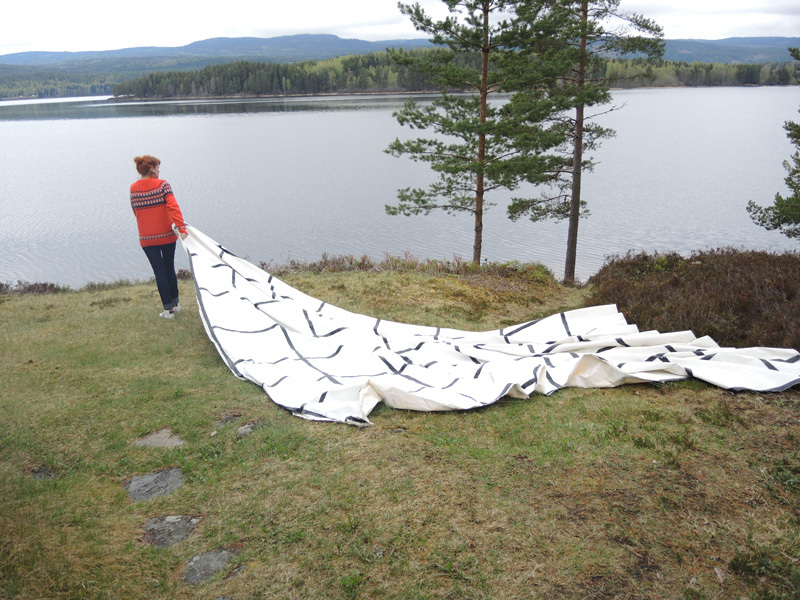 She studied textile art at Kunsthøgskolen i Bergen (BA 2005 – 2008, MA 2008 – 2010). In 2008 she was a ‘European Textile trainee’ at the University of Art and Design, Helsinki, Tilburg Textielmuseum, and at Ratti textile company in Italy. Her most recent solo exhibitions include Feltarbeid at Galleri Svalbard in Longyearbyen (2017), Kunst på vandring organized by Akershus Kunstsenter (2015), and at Galleri BOA in Oslo (2015). Frantzen has also participated in group exhibitions in Norway, Germany, the US, Sweden and Lithuania.